If you’re still not sure social media is worth the investment, try this one for size: According to a May survey by virtual events provider Unisfair, social media is now the number one emerging channel for lead gen among tech marketers. And while that could seem somewhat skewed based on their occupation, the point is this – social media delivers qualified leads. While the conversations, brand awareness and friends make you feel good, that’s not the power of social media. The power of social media is that it connects you to qualified leads and puts more money into your bank account. According to the Unisfair survey, 66 percent of respondents said lead generation their greatest concern for the year. The findings seem to match R2integrated’s April survey that found 61 percent of respondents were after lead generation, as well as HubSpot’s report that Twitter usage could double monthly leads for SMBs. 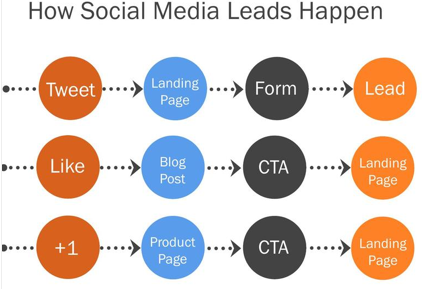 In case you need a recap: Social media = leads. Why is social media such an effective lead generation tool? Simple. It Distributes Your Content: When you put content on your Web site, no one but your current customers or prospects see it. When you upload that same content to Facebook, to YouTube, to StumbleUpon, to Flickr, to Twitteryou take advantage of larger and larger networks. Networks that have thousands of active users who are there to consume and share content. The more people who see it, the more brand awareness you earn, and the more people who will be driven back to your Web site and placed in a conversion funnel that you create. You Pick Up Sitting Duck Clients: Stop what you’re doing and go to Twitter Search. Click on the Advanced Search option (or just click that link) and create a Saved search designed to pick up ‘sitting ducks’. For example, if you’re a local mechanic, you may want to set up a search for [brake job], [car inspection] or [oil change]. Set the distance for 25 miles from your place of business and then save the search. Now any time someone in your local area tweets about needing a brake job, a car inspection or an oil change, you’ll be notified. And then you can reach out to that person. You can also create searches for you competitors and try to steal those conversions away. Answer Questions Qualifies You For Future Jobs: While you’re near Twitter Search, enter in some business-related keywords and look for folks asking questions about whatever it is you’re an expert at. When you can, answer them. Go to Yahoo Answers, Business Answers and any other relevant question/answer site and do the same thing. This is a great way to increase leads by using your expertise to pre-qualify you for the job. For example, my Twitter friend Andrew Norcross commented that he often answers people’s WordPress-related questions and has received both freelance and long term clients from it. Answering questions is a good way to establish your authority, but also for people to “test you out” before they commit to a larger contract. Delivers Trusted Referrals: One of the most obvious ways social media delivers leads is through social media referrals. Through your interactions on Twitter, on Facebook, wherever, you make your presence known to colleagues and users. You converse with them and develop relationships so that they feel like they “know” you. Then, when they have a job they can’t take or they hear about someone in their network looking for a local caterer, they remember you and recommend you for the job. Connects you to local professionals: Another way that social media can deliver leads is by connecting you to other professionals in your area that you can talk, debate and share information with. For example, I belong to the Albany, NY Marketing Professionals and Internet Marketers of New York groups. Both groups serve as discussion forums for people to share advice and to pass on referrals or freelance opportunities as they come up. It’s a great way to connect and build trust. Social media is an emerging lead generation tool because, quite simply, it lowers the barrier to the sale. By building relationships, displaying expertise and networking, you’re able to bring in more people than cold calling ever could. 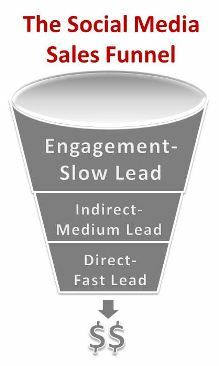 Where does social media fit into your sales funnel?